PIGEON FORGE, TN — New Sparkling Holidays Commemorative Forever stamps featuring classic images of Santa are available for mailing holiday cards and letters this year— a time-honored tradition embraced by millions annually. The Postal Service dedicated the stamps at a special ceremony today at The Inn at Christmas Place in Pigeon Forge, TN. In addition to Corbett, the ceremony included remarks by Justine Fletcher, director of Heritage Communications for The Coca-Cola Company. News of the stamps is being shared using the hashtag #SparklingHolidaysStamps and a video of the ceremony will be available on the Postal Service’s Facebook page. 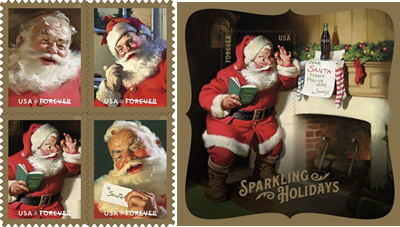 The Sparkling Holidays stamps, sold in booklets of 20, feature four classic portraits of Santa Claus. Taken from larger paintings created by Sundblom, these vintage images were originally published in ads for The Coca-Cola Company from the 1940s through the early 1960s. Sundblom is credited as the individual who most refined the modern image of Santa. In addition to the stamp booklet, a souvenir sheet is available which includes a stamp and depicts a wider scene of one of Sundblom’s paintings chosen for the Sparkling Holidays stamp booklet. In it, Santa is depicted standing by a fireplace holding a book that lists good boys and girls. Three Christmas stockings hang along a mantel decorated with greens and ornaments. Peering over his glasses, Santa reads a note. The use of gold metallic ink, the flow of the type, and the organic shape of the border harken back to graphic styles of the first half of the 20th century. Art director Greg Breeding designed the stamps and the souvenir sheet with existing art by Sundblom. Several 19th century European works were instrumental in creating character traits that inspired Sundblom’s paintings, including an 1809 portrayal by author Washington Irving of the gift-bearing St. Nicholas as a sage Dutchman rather than the more common previous image of a somber bishop. Santa Claus, as we know him today, originated from the 1821 poem “The Children’s Friend,” which claimed “Santaclaus” delivered toys to good children while riding a sleigh drawn by a flying reindeer. Several years later in the poem “A Visit From St. Nicholas,” the number of reindeer increased to eight and Santa was depicted as a jolly, plump elf who delivered presents Christmas Eve. Beginning in 1863, Cartoonist Thomas Nast embellished Santa’s look in drawings for Harper’s Weekly magazine. He depicted Santa in all manner of guises, from a portly elfin figure to a big-bellied, white-bearded man. In 1931, Sundblom created the first of more than 40 paintings of Santa Claus for The Coca-Cola Company’s holiday advertising campaign. The Sparkling Holidays stamps, sold as Forever stamps, are always equal in value to the current First-Class Mail 1-ounce price. Customers may purchase the stamps and other philatelic products online through the Postal Store at usps.com/shop, by calling 800-STAMP24 (800-782-6724), by mail through USA Philatelic catalog, or at Post Office locations nationwide. The souvenir sheet will only be sold through usps.com or by calling 1-800-STAMP24.